Mossy Oak Break-Up Pink-Trimmed Halter Top - 607421 This comfortable contour-fit halter top is padded and fully lined, featuring soft pink accents. Made from a comfortable, durable polyester/spandex blend. Ties at both neck and back for a perfect fit. 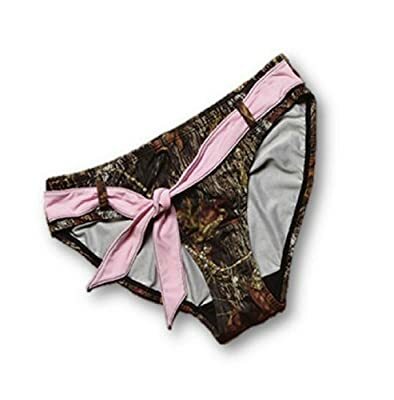 Mossy Oak Break-Up Pink-Belted Swim Bottom - 606321 This lined swim bottom works with any Wilderness Dreams swim top, and is accented by an attached pink belt. Made from a comfortable, durable polyester/spandex blend. All Swimwear Sales are Final - Absolutely No Returns!